Stainless Steel Sterile Air Filter Housing and Steam Filter Housing are horizontal, in-line high efficiency filter housing which used to remove contaminate particles from steam and compressed air systems. They are full stainless steel structure, with high purity surface to meet the hygiene requirements, suitable for use in steam, gas and liquid systems etc. The filter housing is available in stainless steel SUS304, SUS316L, it is externally polished with an internal natural finish or on request whereas the 4″ to 10″ housing will have a natural finish both internally and externally or on request. Application: widely used in beer, engineering, food engineering, chemical engineering, pharmaceutical engineering, biological engineering and water treatment engineering and other fields. 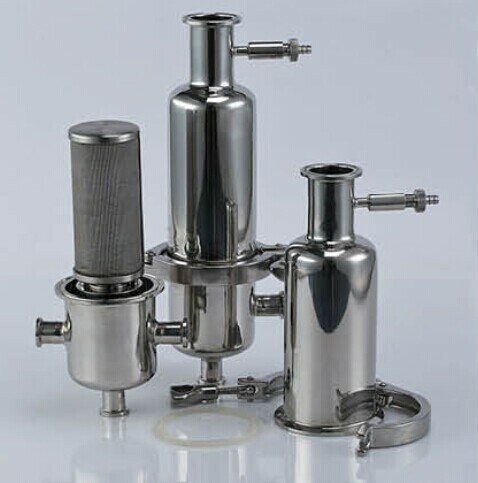 Stainless steel sterile air filter housrings adopts hydrophobic Teflon or polypropylene folding type micro-porous membrane. The filter housing is high quality stainless steel 304/316L, and filter cartridge adopts USA/Japan origin material, designed and manufactured according to GMP standard, it is with high efficient, energy saving, safety, reliable etc. Wellgreen sterile air filter housing is designed specially for the pharmaceutical industry, food industry, air exchange tank to reaches the purpose of sterilization function, the air filtration accuracy is 0.02µm particles, with 99.99% efficiency, the filtration capacity is in the range of 0.1-100m³/min. The medium thickness is 0.8mm only, pore size uniformly and steadily, with small gas resistance and regeneration conveniently. The filter cartridge can be used for 2~3 years commonly, but it can be extended to four to six years after regeneration. The air filter housing can be used for steam sterilization filtration system. The air filter housing can completely solve the problem of air contamination, but also improve the quality of disinfection and sterilization to achieve GMP and aseptic hygiene requirements. Idea choice for beer, engineering, food engineering, chemical engineering, pharmaceutical engineering, biological engineering and water treatment engineering and other fields. * For more information about Stainless Steel Sterile Air Filter and Steam Filter Housing, please contact us when you feel free.